The name Barangaroo has become common parlance among Sydneysiders and visitors who regularly enjoy the spectacular Barangaroo Reserve and the new retail and dining precinct. But what of the proud Cammeraygal woman Barangaroo, after whom this culturally-significant area is named? This strong and influential warrior woman provided the inspiration for Barangaroo’s first Artistic Associates, renowned Aboriginal multi-media artists and curators Amanda Jane Reynolds and Genevieve Grieves. 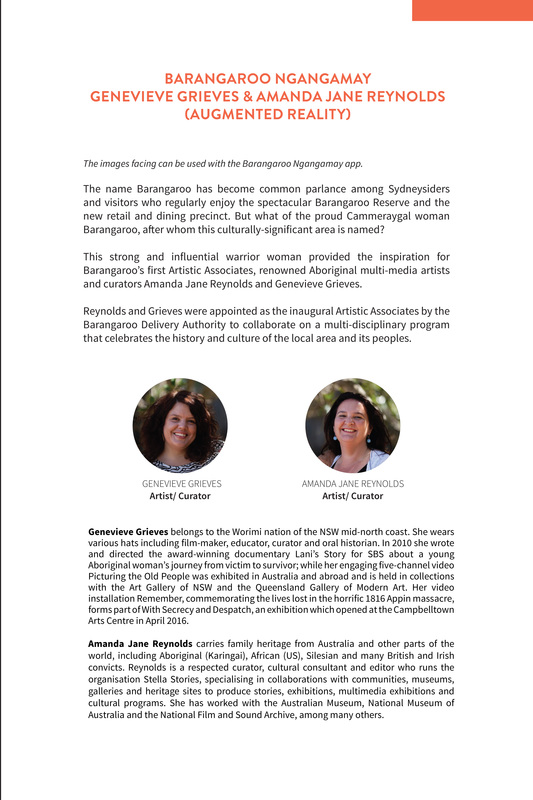 Reynolds and Grieves were appointed as the inaugural Artistic Associates by the Barangaroo Delivery Authority to collaborate on a multi-disciplinary program that celebrates the history and culture of the local area and its peoples. Amanda Jane Reynolds carries family heritage from Australia and other parts of the world, including Aboriginal (Karingai), African (US), Silesian and many British and Irish convicts. Reynolds is a respected curator, cultural consultant and editor who runs the organisation Stella Stories, specialising in collaborations with communities, museums, galleries and heritage sites to produce stories, exhibitions, multimedia exhibitions and cultural programs. She has worked with the Australian Museum, National Museum of Australia and the National Film and Sound Archive, among many others. Reynolds, Amanda. 2018. “Barangaroo Ngangamay: Augmented Reality”. In Decolonising the Digital: Technology As Cultural Practice, 132-45. Sydney: Tactical Space Lab. http://ojs.decolonising.digital/index.php/decolonising_digital/article/view/BarangarooNgangamay.